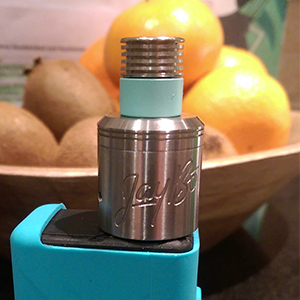 So a follow up after Paul Edge and Tim Clark posted up a review video for the Jay Bo RDA Indestructible. Indestructible is an RDA (for those of you who are new to vaping this is a Rebuildable Dripping Atomiser) which is said to be different to those currently on the market. The boys got onto this straight away and had to check it out. Findings? They seem to agree that this is something special. I believe “Near perfection” at one point were there exact words. So let’s talk about the Indestructible firstly what a great name anything with that name I want!! First impressions it has a sleek design with a nice finish and Jay Bo engraved signature. As suggested an engraved signature may not everyone’s cup of tea but it definitely suits the RDA and I think it adds a nice personal touch. Internally the Indestructible is built well with a nice “o” ring on the cap and a small groove which allows an easy on and off approach. I mean how many of you have issues with getting caps off your atty?? I know I do! The design is sleek and stops the dreaded juice spitting from the top cap. That said for those of you who want a larger RDA cap this is more restricted, but I would say give it a go. With a near perfection design the restricted air flow is not a negative but blends beautifully with the overall build. The airflow of the Indestructible is good with 2mm air flow holes of which you have a choice of either using single or dual coils. Adjustable air flow is something as suggested by Paul and Tim as a slight downfall. It’s always nice to have the option but it doesn’t take it away from how nice the RDA is and how well it works. The Indestructible has beautifully made internals with a broad connection under the centre post, and for those builders out there this is definitely something you will appreciate. The actual internal surface area is of a good size to allowing you to mix up your builds a little when it comes to coiling choice. Another great point for most of us is the flattened screws which means no more searching for that one screwdriver I can use any. Further to this no more coils getting sheared in the process! Indestructible has a copper 510 insulator which means we can use this on most mods. It’s a good length and will sit nicely on top of mods without looking out of place. 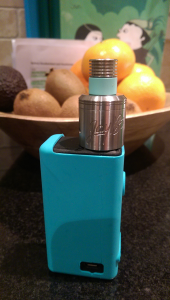 This entry was posted in Reviews, Vapeology and tagged atomiser, atomizer, atty, Indestructible, Jay Bo, Post ho;les, RDA, Rebuildable Dripping, tobh. Bookmark the permalink.